We don’t go out to eat that often, but when we do, we usually go to the local Mexican joint down the road. Our favorite place closed last year. The friendliest family ran it. They were always so great with Andrew, the food was always good – we just loved them. They moved on to another part of the country to start a new venture, and left me with no Mexican eats locally (outside of my home, of course) for about 6 months. In desperation one day, I browsed Mexican restaurants in our vicinity on Yelp. To my surprise, one turned up in a town nearby – a nice 30 minute drive on the back roads. I must admit I was leery, as Crisfield is known primarily for it’s seafood (blue crabs, oysters, etc). I wondered how good could this place be? I’d never heard of it. But, like I said, I was desperate. So, one night, we ventured up. We were blown away with the dinner we got at that little hole in the wall place. The proprietor/chef hails from South America, so there are lots of great Latin options – as well as traditional Tex Mex fair. While a new place has opened up closer by, we still try to make the trip to Mi Pueblito whenever we can. My favorite thing on the menu is the black bean soup. So simple, yet so flavorful and filling. Nice and smoky from the ham hock, and rich silkiness that only black beans can lend.I always devour the whole bowl, then have very little room for dinner. I made a batch last weekend at home in an effort to recreate their version, and it is right on point. As with other soups, it was even better the second day for lunch. The pico de gallo on top is optional, but highly recommended. It adds a great pop of color and flavor! Heat olive oil in large dutch oven over medium-high heat. Add onions, and saute until starting to brown on the edges, about 4 minutes. Add the garlic and cook until fragrant, about 1 minute. Add beans and ham hock to the pot, followed by 8 cups water, bay leaves, and salt. Bring to a boil, reduce heat to a low simmer. Cover and let cook at least 3 hours, until beans are tender. Remove bay leaves and ham hock from the pot. Add cumin and chili powder, and stir to combine. Cook for another hour on low. Remove 4 cups of the soup (about half of it) to a blender. Purée until smooth and return to the pot of soup. Or, if you have an immersion blender, feel free to use that to achieve the desired consistency. I wanted mine nice and smooth. Add lime juice, stir to combine. Season with salt to taste. Top with a dollop of sour cream and pico de gallo. 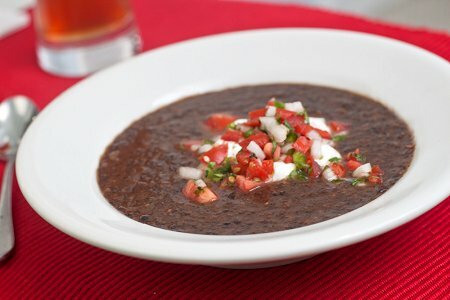 I’ve never actually had black bean soup before, but this looks great! I ve never eaten anything like this before… looks really interesting! Oh the horror of not having a Mexican restaurant close by! I’m not sure what I would do since that is usually my first choice on the rare occasion we go out. I’m glad you found one, though. Your black bean soup sounds perfect! I love the pico de gallo on top…I always need a little tomato and pepper with my black bean soup.